Investors may want to consider unloading bonds in favor of crude oil. 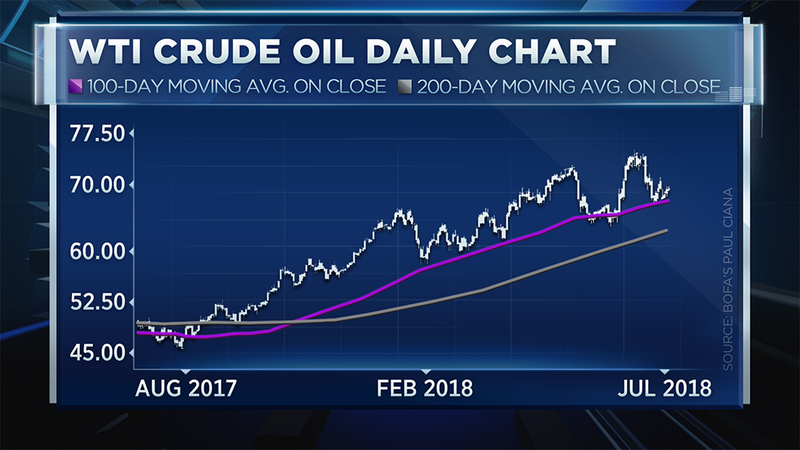 According to Bank of America-Merrill Lynch's Paul Ciana, there are two particular charts that point to an oil breakout that could garner solid returns over the next 6 to 12 months. 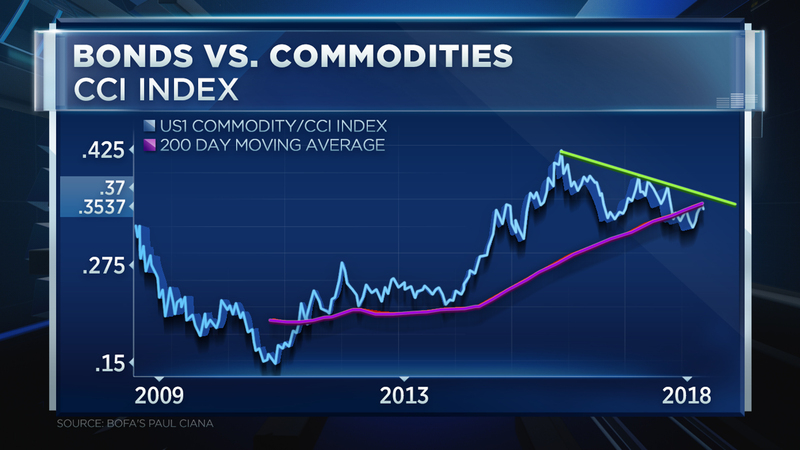 The firm's chief global technical strategist's first chart compares commodity prices to bond prices. "You'll see that there is this big head and shoulders up here in that ratio," the firm's chief global technical strategist said Thursday on CNBC's "Futures Now." "Earlier this year, that ratio broke down below that neckline." But now, Ciana said, that ratio has corrected back up to the resistance pocket — a move that makes a compelling case for commodity prices to rise. "This is the exact technical point where market participants should be shorting bonds and going long commodities, especially if this relationship is going to hold up and remain true which, of course, I think so," he said. Bond prices, particularly the 10-Year Treasury Note, have been under pressure as yields climb. They've been facing headwinds as central banks around the world raising interest rates and ending quantitative easing programs. Ciana's second chart shows the strength of WTI (West Texas Intermediate) crude oil. Even though the price has softened over the past five trading sessions, the commodity has rallied almost 7 percent over the last six weeks. It's now bouncing around $69 a barrel. "There's still a strong trend line here that's still in place suggesting that the trend is, in fact, higher," he said — highlighting that the 100-day moving average is holding as support in an upward sloping channel. Ciana, who sees WTI "accelerating into the $77s," called the current level a low risk entry point to buy oil.